On this day in 1944, Bob Montgomery, the Philadelphia Bobcat, clawed his way back to the top of the lightweight division with a 15-round split decision over Beau Jack, the man who had taken his title just four months before. The fight took place before a crowd of 19,066 dizzy fans at New York's hallowed hall, Madison Square Garden. Montgomery had to struggle to make the 135 pound limit, but his work in the steam room did the trick. The fight itself was a hard-fought battle where many of the rounds could have gone either way. Jack took the first two sessions before Montgomery strung together rounds three through nine. In the tenth, Montgomery's steam work and Jack's persistence started to take its toll. As Bob started to tire, Jack closed the gap. But Monty showed his stuff and kept fighting, even though his strength was sapped. The contest went the fifteen round limit and in the end, the official vote was split and close all the way around. With the win, Montgomery became the third man ever to regain the lightweight title. The previous two men to manage the feat were Lou Ambers & Beau Jack. Bob Montgomery and Beau Jack fought each other a total of four times in 1943 & 1944. Their rivalry was one of the great disputes of the lightweight division - four evenly matched bouts at the Garden - three for the title, all four matches went the full limit, 55 total rounds, with each man winning two fights. In their four bouts, the title changed three times. 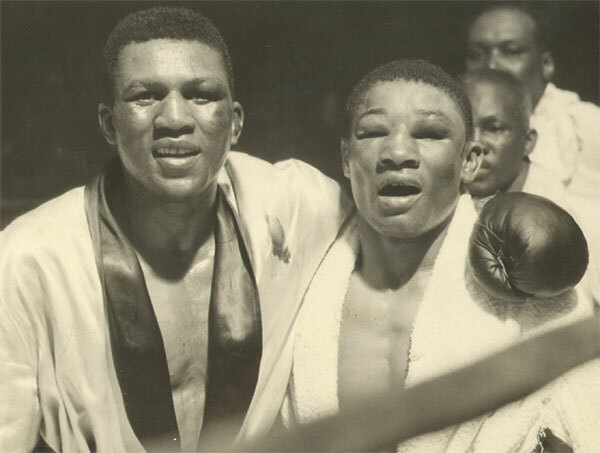 Although they were fierce opponents, Jack & Montgomery remained friends outside the ring.